Scotland boss Andy Robinson has named seven uncapped players in his training squad ahead of the autumn internationals. 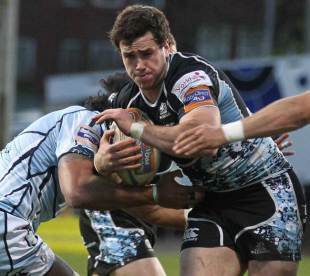 Robinson has called on five fresh faces from the Glasgow Warriors and two from Edinburgh. Edinburgh's back-rower Stuart McInally and Glasgow Warriors' Alex Dunbar both travelled with Scotland on their unbeaten tour of the southern hemisphere in June and they could make their debut for the national side come November. Elsewhere, Robinson has called up Glasgow backs Peter Horne, Peter Murchie, Tommy Seymour and Henry Pyrgos alongside Edinburgh second-row Grant Gilchrist. But while Robinson has opted to blood seven new faces, he will be without a host of proven international players with the likes of Joe Ansbro, Moray Low, Chris Cusiter, Graeme Morrison and Rory Lamont all sidelined due to injury. Scotland kick-off their November Test programme with a mammoth clash against the All Blacks at Murrayfield on November 11. This is followed up by a match with the Springboks on November 17 and they complete their three-Test programme facing Tonga at Aberdeen's Pittodrie Stadium on November 24. After Scotland face New Zealand, Robinson and his assistants will re-assess the squad. The squad will assemble at St Andrews on October 29-31 ahead of the All Blacks match and Robinson wants his side to push on from their successful summer tour of the southern hemisphere. "It's always an exciting time when the Scotland squad comes together ahead of the first Test match of the season," Robinson said. "It's some four months since Scotland last played an international so when the squad reconvenes there'll be an element of renewing acquaintances and reigniting the spark and spirit that was such a key part of our success on our summer tour. "New Zealand are formidable opponents. They do the basics exceptionally well and play with a pace and ruthlessness. It's no co-incidence that they are the best team in the world. We must look to build on the physical commitment of our players against Australia, Fiji and Samoa." Backs - Joe Ansbro (London Irish), Ben Cairns (Edinburgh Rugby), Chris Cusiter, Rory Lamont, Graeme Morrison (all Glasgow Warriors), Nikki Walker (Worcester Warriors) and Duncan Weir (Glasgow Warriors).